Cartoons that illustrate evolution depict early vertebrates generating primordial limbs as they move onto land for the first time. But new findings indicate that some of these first ambulatory creatures may have stayed under water, spawning descendants that today exhibit walking behavior on the ocean floor. The results appear February 8 in the journal Cell. "It has generally been thought that the ability to walk is something that evolved as vertebrates transitioned from sea to land," says senior author Jeremy Dasen (@JeremyDasen), a developmental neurobiologist in the Department of Neuroscience and Physiology at the New York University School of Medicine. "We were surprised to learn that certain species of fish also can walk. In addition, they use a neural and genetic developmental program that is almost identical to the one used by higher vertebrates, including humans." 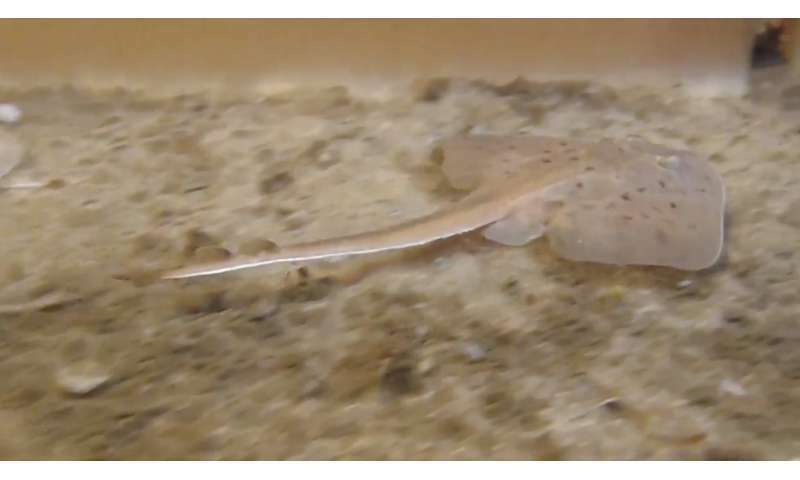 The researchers focused on the neural development of a type of fish called the little skate (Leucoraja erinacea). Related to sharks and rays, these cartilaginous fish are considered to be among the most primitive vertebrates, having changed little from their ancestors that lived hundreds of millions of years ago. Little skates have two sets of fins: large pectoral fins, which they use for swimming, and smaller pelvic fins, which they use for walking along the ocean floor. Previous research had shown that these fish use alternating, left-right motions when they walk, similar to the motions used by animals that walk on land, making them a valuable model to study. The investigators used a technology called RNA sequencing (RNA-seq) to assess the repertoire of genes that are expressed in the skate's motor neurons. They found that many of these genes are conserved between skates and mammals. In addition, they discovered that the neuronal subtypes that are essential for controlling the muscles that regulate the bending and straightening of limbs are present in the motor neurons of the skate. "These findings suggest [that] the genetic program that determines the ability of the nerves in the spinal cord to articulate muscles actually originated millions of years earlier than we have assumed they appeared," Dasen says. "This fin-based movement and walking movements use the same developmental program." The discovery went beyond the nerves that control muscles. The researchers also looked at a higher level of circuitry—the interneurons, which connect to motor neurons and tell them to activate the muscles. Interneurons assemble into circuits called central pattern generators (CPGs). 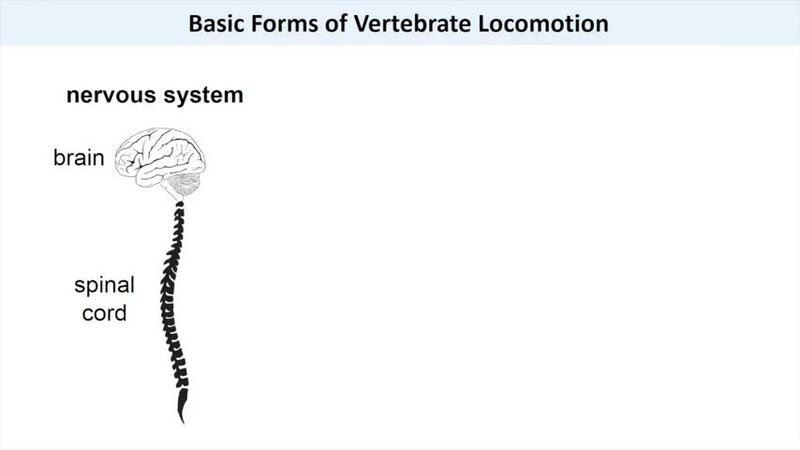 CPGs determine the sequence in which different muscles are activated, thereby controlling locomotion. "We found that the interneurons, nearly a dozen types, are also highly conserved between skates and land mammals," Dasen says. Dasen's team plans to use the little skates to study how motor neurons connect with other types of neurons and how they are regulated. "It's hard to study the circuitry that controls walking in higher organisms like mice and chicks because there are so many more muscles and types of neurons that facilitate that behavior," he says. "We think this species will serve as a useful model system to continue to work out the nerves that control walking and how they develop." Very funny. "living fossils" should stand for "no such thing as evolution". "We were surprised to learn that certain species of fish also can walk. In addition, they use a neural and genetic developmental program that is almost identical to the one used by higher vertebrates, including humans." Why would that happen? It flies in the face of the "evolution" myth. How do you get neural circuitry before the hardware?! ?